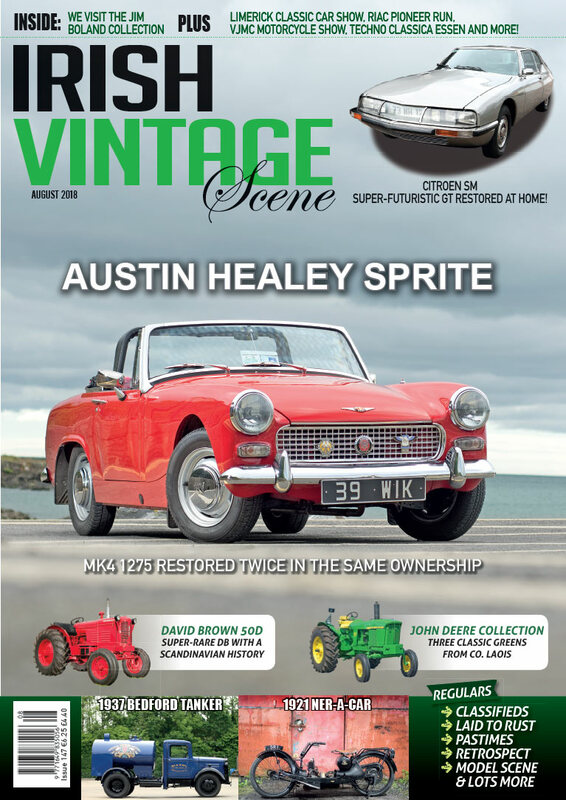 The August 2018 issue of Irish Vintage Scene (Issue 147) is now on sale, and on the cover this month isn’t what you might think at first glance – thanks to a longer production run the MG Midget sold in much larger numbers than its badge-engineered twin, the Austin Healey Sprite Mk2, which didn’t stick in the memory quite as much as its famously frog-eyed Mk1 predecessor. This cherished ’69 Mk4 has been in its present ownership for well over 30 years, and has been restored twice in that time. Our second feature car is about as far-removed as you can get from the simple little Sprite, despite coming from the same era – the Citroen SM was an exotic tour de force when it was launched in 1970, with its quad-cam Maserati engine, aerodynamic styling and hydraulic everything. Ownership costs mean that owner-restorers are scarce, but this one was rebuilt at home decades ago and is still running strong. And, as an extra bonus this month, we visit renowned vintage car collector Jim Boland to merely scratch the surface of the fascinating machinery he has in the garage. Our first feature tractor this month looks at a real rarity in the realm of classic David Browns – the big six-cylinder 50D was an unsuccessful bid by David Brown to produce a powerful drawbar tractor for export markets, and all surviving examples are cherished today, and particularly our feature tractor. Our second tractor feature showcases a trio of beautiful John Deeres restored by their mechanic owner, comprising of a 4010, 1120 and 3130 and representing a range of sizes and horsepowers. Our motorcycle feature this month is a true oddity, not quite a car and not quite a motorcycle – the aptly-named Ner-A-Car was a 1920s attempt to woo commuters onto two wheels by combining car-like levels of convenience and handling with the economy and fun of a motorcycle. A relatively short-lived affair, the Ner-A-Car always attracts attention whenever it appears in public, and particularly our featured example, which is in the same family since 1970. Our commercial vehicle feature looks at a beautifully-restored 1930s Bedford WLG tanker that’s gone from refuelling Irish Air Corps aircraft to a promotional vehicle for a major Irish fuel brand. 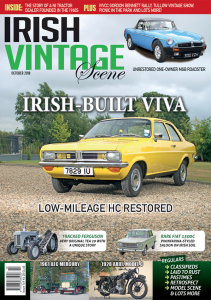 Event reports in this issue include the Shane’s Castle Steam Rally, RIAC Pioneer Run, Limerick Classic Car Show and the Principal Insurance VJMC Classic Motorcycle Show, and all of the usual favourites are in there too, so don’t miss out.